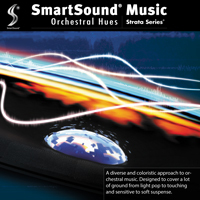 This Multi-Layer Strata release offers a diverse and coloristic approach to orchestral music. Designed to cover a lot of ground from light pop to touching and sensitive to soft suspense, yearning and more, it offers an effective toolset to the media creator who needs access to live orchestral music in a stemmed format - a rare find. Complete control with SmartSound technology over the instrument stems, timing of beats and length of the track as well as other capabilities make these tracks valuable beyond the sheen of their live orchestration.